Beury Mountain, in central Fayette County, rises to 2,594 feet above sea level on the eastern flank of the valley of the New River east and southeast of Thurmond, West Virginia. The mountain may also be considered a western arm of Mann Mountain. Beury Mountain was named in honor of Colonel Joseph Beury, one of the early developers of the New River coalfield. The mountain is sometimes mapped as Bury, Beary, Buery, and Berry. The Beury Mountain Wildlife Management Area protects much of the remote highland region atop the mountain. 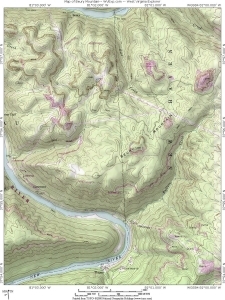 Its western flanks descend into the territory of the New River Gorge National River.